Today I’m so excited to welcome liZ, one of the two, from Simple Simon and Company! The ladies behind one of my favorite blogs! I’ve read for so much beautiful inspiration for those times I decide to sew for the nieces. There’s just a real elegance going on over there! I’m sure I’ve said it before, but my all time favorite project from their blog is the Audrey Cape! So pretty and so simple to make! I’m liZ (one of the two Elizabeth’s) from over at Simple Simon and Company and we are so happy to be joining Louise again this year for her Sew Ready to Play series! I had visions this year of what I was going to make….and I was in love with my plan…and then real life happened, plans were changed, and Grace ended up choosing what we made for the final project. Anyways, back story aside, the outfit we put together today for Sew Ready to Play is a Domino inspired look. 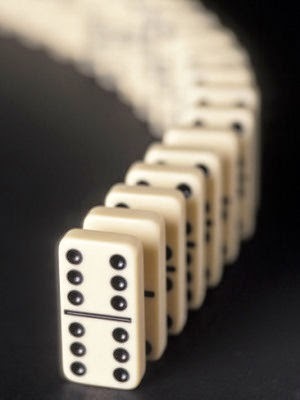 Our kids are into playing Dominos right now. (So much so that we made them a giant set for Christmas last year.) And Grace thought this giant polka dot fabric that I had in my stash was perfect for a Domino skirt. The skirt we made is a simple colored blocked skirt with an elastic waistband and then she paired it with her favorite leggings (from Target, not handmade), a hand-me-down T-shirt, and a black blazer from last year. She was pretty proud of the styling. Her whole outfit was black and white….and it has the dots on the skirt….and the stripe on her leggings….and the solid on her blazer…. This is how she looked when she wore it to school this morning. And I can’t argue with that face. 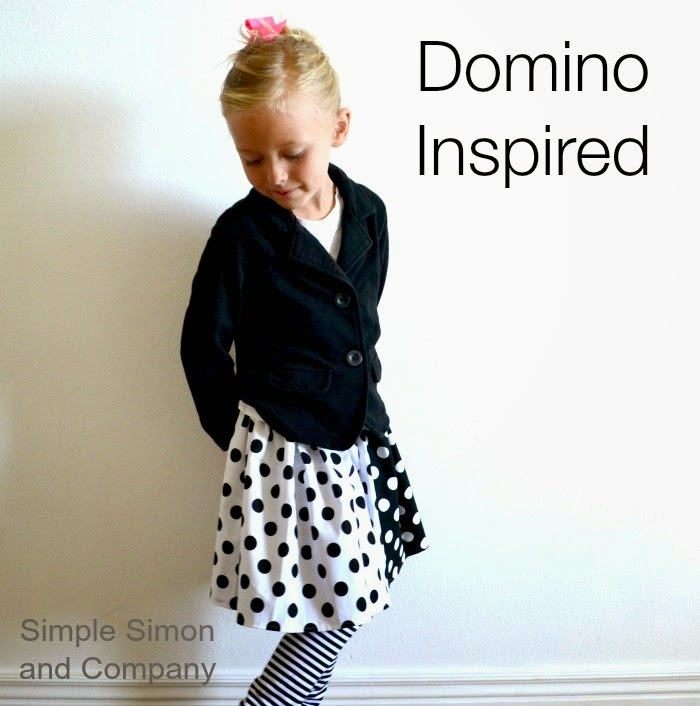 She loved her “Domino Clothes”. Thanks Louise for inviting us to your series. It’s just so much fun! We love it! Architect. Artist. Crafter. Photographer. Sew-er. Quilter. Mother. Wife. I make because it’s what fulfills me (well, second to my adorable family, that is). Sit still? Um, nope. Not very good at that. It’s the art of making things that inspires me to a life of self inflicted insomnia. This blog is where I write about things I make for friends and family, things I make to sell and things that inspire me. I love feedback, so please leave comments! And feel free to contact me at imfeelincrafty @ gmail dot com! Follow Me! This Way To…. Ahoy Matey! It's a Pirate's Party for Me! All photos are taken by me of my original work unless noted otherwise. Please link back and give credit if you use anything from this site. Do not use more than one photo per blog post. If you are sharing a tutorial, please direct your readers back to my blog, do not copy my content on to your blog. Everything I post on my blog is for your personal use only- not for resale or redistribution. 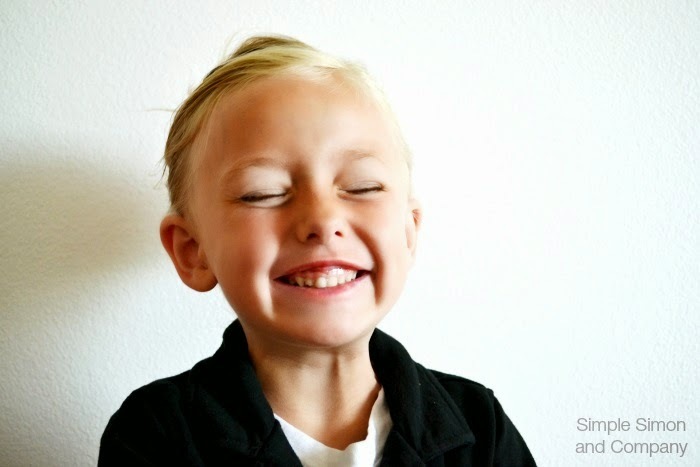 Do not use pictures of any children photographed on this blog without prior approval. And lastly, please do not reprint my posts in thier entirety. I truly appreciate being mentioned in your blogs, etc, with the proper credits, but I spent a lot of time writing my posts and would like for the work to stay here, where it was written. I know this is a lot of 'do this' and 'don't do that', but thanks for respecting my creative part of the world! Wordpress has enabled an option for reblogging posts. I do not agree with this option, due to what I have mentioned above. I take a lot of time to write, photograph and blog about the projects I do. Please respect my desire to NOT reblog posts from my blog. This blog has a lot of DIY projects and all DIY projects inherently involve risk. I do not claim that all projects are tested for child or infant safety. As the writer of this blog, I have written instructions to the best of my ability and as I have made the projects, but this still leaves you, the reader, responsible for your own selection of tools/supplies and methods. Please follow manufacturer's instructions, be safe and use common sense!